The defining feature of the mall is its 100-metre-long atrium, which has been especially designed to allow shoppers and uninterrupted view of every shop front within the mall; thereby making the centre a customer-and retailer-friendly property. Oberoi Mall has been designed by Bental & Associates of South Africa, one of the best-known architects in shopping centre design globally. The premium design aesthetics and material standard of the mall ensures a “best-in-class” environment for a complete family shopping experience. The three anchors of this fully Wi-fi mall include PVR Cinemas offering a 1,900-seating capacity 6-screen mutiplex, Central, and Lifestyle, which houses popular brands under one roof. The food court in the mall is managed by Blue Foods. The mass also houses Mumbai’s first Debenhams, the well known global retail chain. Over 80% of the mall is leased to well known international retilers and is a predominantly fashion and lifestyle retail mix. 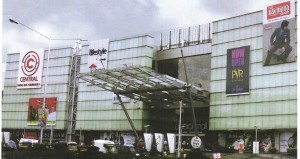 Oberoi Mall has a double basement parking with a parking capacity of around 1,000 cars. For the first time ever, a mall in India also offers driver announcement facility, computerised tickets and electronic indicators to guide the customers on the availability of parking. The mall has placed sensor-based football cameras to map conversions at each corner in the centre, apart from regular CCTV security management.